If you run an ecommerce store, overlooking your terms and conditions isn’t an option. Your terms are an essential tool for avoiding customer disputes over product defects, payment methods, shipping fees, and more. Our FREE ecommerce terms and conditions template will give you a head start toward creating your own. Scroll down below to download our template and view related terms and conditions examples. What are Terms and Conditions for Ecommerce? Does your Online Store Need a Terms and Conditions? Expand the accordion below to view the full text version, or click the button under it to download the template as a Microsoft Word doc and PDF. Option 1: The Site is intended for users who are at least 18 years old. Persons under the age of 18 are not permitted to use or register for the Site. All products are subject to availability[, and we cannot guarantee that items will be in stock]. We reserve the right to discontinue any products at any time for any reason. Prices for all products are subject to change. We accept the following forms of payment: _______________________. You agree to provide current, complete, and accurate purchase and account information for all purchases made via the Site. You further agree to promptly update account and payment information, including email address, payment method, and payment card expiration date, so that we can complete your transactions and contact you as needed. Sales tax will be added to the price of purchases as deemed required by us. We may change prices at any time. All payments shall be in U.S. dollars. [If your order is subject to recurring charges, then you consent to our charging your payment method on a recurring basis without requiring your prior approval for each recurring charge, until such time as you cancel the applicable order.] We reserve the right to correct any errors or mistakes in pricing, even if we have already requested or received payment. [All sales are final and no refund will be issued./Please review our Return Policy posted on the Site prior to making any purchases]. Need terms and conditions for your blog or mobile app? See our library of T&C templates. 2. 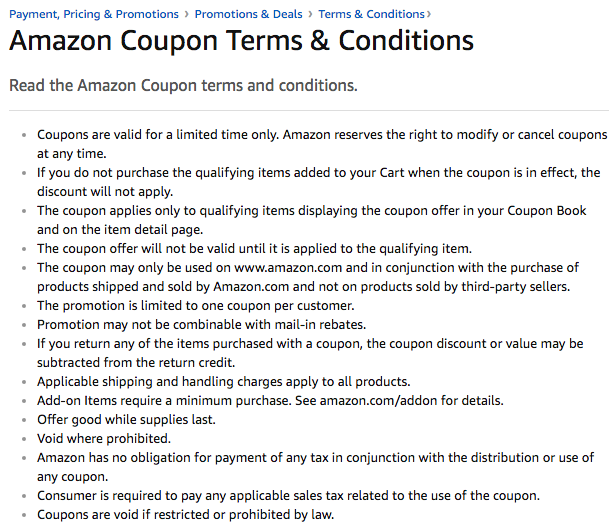 What are Terms and Conditions for Ecommerce? An ecommerce terms and conditions is a legal agreement that explains the rules regarding things such as owner-customer responsibilities, pricing and payment, returns, promotions, and shipping details. The terms for an ecommerce shop will also limit the business’s liability for the accuracy of product descriptions, availability of products, and product defects. As it’s a legal contract between an owner and their customers, the goal behind creating a terms and conditions is to create an extra layer of protection for an online business. Furthermore, a clear and easily accessible terms and conditions can serve as a means of offering your customers a sense of clarity and trust in your business practices. For more help understanding the necessary clauses and characteristics, check out our how to write terms and conditions guide. 3. Does your Online Store Need a Terms and Conditions? Surprisingly, there is no law that requires an online store to present a terms and conditions agreement. With that said, dismissing your terms as an overly cautious, nonessential legal document is a huge mistake. Your terms is a critical document because it will help protect your business by limiting your liability, preventing misuse of your site by customers, and establishing ownership of your content and intellectual property (IP). While no laws explicitly establish the need for terms, there are some regulations that specify what a legally-binding terms and conditions should look like. Moreover, if you do have one on your website, it may be legally required – dependent upon your location – for it to be written in plain language and fair to consumers. For example, in Europe terms can voided if they disadvantage consumers or are not grammatically clear and transparent. Don’t have time to write your own? Use our terms and conditions generator. Although no two terms and conditions are exactly the same, there are valuable lessons that can be learned from reviewing agreements from other online stores. Let’s examine some prominent examples from the top ecommerce websites to discover some features that you can apply to your own terms of service. Promotions and discounts are a great way to drive new customers to your site. However, if details regarding eligibility, time constraints, and qualifying items are not clear to consumers, your promotion can quickly become a customer service nightmare for your business. The bullet point format makes it easy for consumers to skim through the list and learn how and when the promotion can be used on Amazon. When completing this section, consider all the questions your customers may have regarding your special programs, and the different scenarios that may apply. As mentioned earlier, prohibited activities for users is a key section of all terms and conditions. Ebay’s user agreement presents an extensive list of forbidden actions that, if taken, can result in the cancellation or banning of a customer account. While it’s helpful to review other businesses’ terms to help you write your own, you should never copy and paste their clauses for your own. A terms and conditions agreement isn’t complete without a detailed explanation of your product warranties and liabilities for things such as products, content, and third-party services. Without this section, you leave your business at risk to be sued for a long list of legal issues. Creating lengthy terms and conditions for your ecommerce website can feel like a burden, especially since they are not required by law. But without a thorough set of terms, you put your business in an unnecessarily risky legal position. Instead of starting with a blank page, use the template above to give you a foundation to build off of and tailor to apply to your own business. Mobile App Terms and conditions for apps in various app stores. Website Terms and conditions for websites and blogs.